Giving comes in all shapes and sizes. 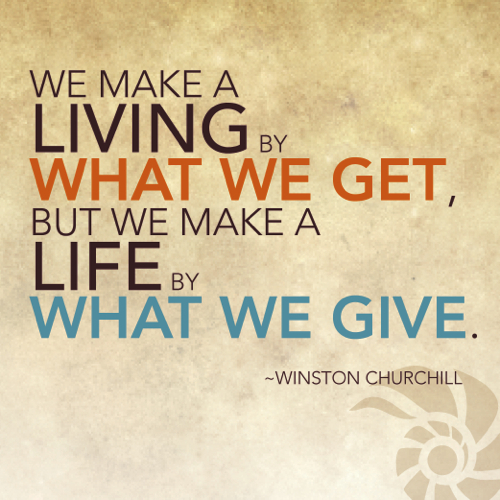 We give what we can, when we can. Some times a little can go a long way. Earlier in the day, my friend and I were talking about our many blessings. A good job, healthy kids and family. Our problems are small compared to others. I stopped eating, put down my burger and reached for my debit card. How could I possibly continue enjoying my hot burger and fries knowing someone standing 10 feet away just wanted something to eat. After standing at the counter for a bit, but the girl didn’t come back to the register. So I stepped to the other side where the food is served where at least five employees were having a pow wow. “Hey,” I said to the manager in the group. “I want to pay for two meals for them.” I told him I didn’t need them to know it was me who paid for their food. He thanked me as I handed him my card. 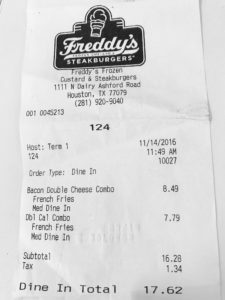 The cashier told them they would get a meal, and just seeing the girl’s joyful reaction was worth the whole $17.62 it cost. How much does giving cost? I don’t believe in coincidence. I don’t often give to pan handlers on the corner, but I was meant to be at that restaurant when those kids walked in. As I glanced at them waiting in a corner booth for their food, I realized that they are around the age of my own kids who are 19 and 22. I have no idea what their story is, or where they are headed. In the end it doesn’t really matter. Give what you can, when you can, and when it feels right. It’s not about getting a pat on the back. But a small gesture of kindness can mean a lot. Next PostNext Does your work evaluation matter, or is it a filed formality?